The race for survival comes to a thrilling conclusion in the heart-stopping finale to the Darkness Rising trilogy, from #1 New York Times bestselling author Kelley Armstrong. Things are getting desperate for Maya and her friends. Hunted by the powerful St. Clouds and now a rival Cabal as well, they're quickly running out of places to hide. All they have is the name and number of someone who might be able to give them a few answers. Answers to why they're so valuable, and why their supernatural powers are getting more and more out of control. But Maya is unprepared for the truths that await her. And like it or not, she'll have to face down some demons from her past if she ever hopes to move on with her life. Because Maya can't keep running forever. 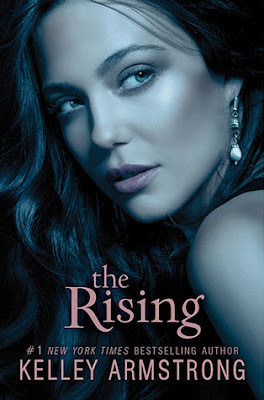 With all the twists, thrills, and romance that have made Kelley Armstrong an international bestseller, plus the surprising return of some fan-favorite characters, The Rising will hold you under its spell long after its breathtaking end. This book follows Maya and her friends as they try to figure out what to do now. They have a name and number of someone to contact in hopes to get help or answers and they stumble on the old gang of misfits The Darkest Powers group. Of course Maya and her friends are the only who have found them the St. Cloud's have found them and are determined to catch everyone even if they have to kill them to get them. Maya is also having trouble with having a brother and her biological father around. Will they ever be free? There was so much going on in this book it was incredible I loved seeing Chloe, Derek, Simon, Tori and company! It was great watching them work together to try to figure out what is next. It also showed that Chloe really wants to stop running they are tired of it. Maya certainly understands that. It also wrapped up really well in the end and was a great adventure to be on. Glad to see where it went from where it began!